Clan Bralor is perhaps one of the most savage and brutal Mando clans in existence. Bralorian's value strength and skill in arms over any of the other forms. Epitomising Discipline and training, Bralorian Mando'ade are more often then not seen serving as heavy shock troopers or heavy weapons specialist. Seen often on the field of battle with piles of corpses littered around them is the standard Bralor dream. Clan Bralor's ranks view death in combat as the ultimate goal. To find a warrior worthy and capable of killing them in a bloody haze of destruction and smoke. When there are no wars to fight, the warriors of Bralor can be found drinking and fighting amongst one another. Often time they will target other clans to entice into a brawl. In fighting is natural for the members of this clan, with some of the most devastating battle resulting in widespread chaos and destruction throughout a town. When an applicant is found worthy of joining Clan Bralor they are assigned a Eldest Brother. These Brothers are responsible for beating and training the hopeful youth into a state of bloody perfection. After usually a year to two years the inductee is brought before the Clans eldest members for their trials. The Trial Of Fire is the true test to of any Bralor, applicants and Bralor youth all must go through this trial. The Applicants are gathered together on Ordo, where the majority of the clan arrives once a year for this grand event. The Youth and Applicants are stripped naked, beaten until they can hardly move and left in the wilds. They have one week to return to their Eldest Brother. Where they feast and drink until the Trial. The Trial for those who survived begins with The Iron Brothers , one of Bralor's traditional and ancient mercenary orders performs the Fire Starter. Along with an elaborate Drill session that involves constantly beating and cutting each other until the ring is literally coated in blood. Afterward the applicants and youth are placed inside of the ring. Where they must fight the night out, those left standing in the morning are considered adults and those applicants still standing are considered honored adults. Only after this ceremony can any member of Bralor be seen as an equal, as a true brother. Even the clan leader slacks off on his abuse to the hopefuls. But only after this ceremony will the Eldest Brother claim the applicant as his child. For Bralor only desires the strongest and most dedicated. The Bralor have many symbols and many traditions that most Mandalorians consider barbaric. And a few that make many of the clans uneasy. The Bralorians do not bury their dead, no that would be a waste of strength and honor. When a Mandalorian dies, their corpse is burned into ash. That ash is mixed together with several grains and various other ingredients to make a thick, hard biscuit. During the time of mourning and remembrance, that is the sustenance that keeps the mourners alive. The Bralor do not see this as cannibalism. They view it as the fallen passing on their last gift to the younger generation. The most honored dead get a special funeral. Their bodies are liquefied and mixed together with the beginnings of Black Ale. Once fermentation is complete, the Clans Eldest and War Honored join together in Keldabe for a week long funeral. Involving imbibing countless gallons of alcohol and ending with this final cask. Most clans have learned to avoid any area this is going on in, as fights start as easy as someone burping. As with most Bralor customs and traditions, this one is bloody and glory and reserved only for those who are outcast or clans has been cast away. To regain their clan's honor they most present themselves to the might of the entire Clan and to do this must present a trophy kill. Nothing short of a creature that could kill a Mandalorian Death Squad will suffice. One this trophy is presented , then the Council Of Fist is convened. One thousand of the most war-hardened and scarred warriors gather. At which point they begin, each warrior strikes the dishonored with his gauntlet until the entire ceremony is complete. Survival is not necessary for the dishonored one's honor to be restored. But those who survive are accepted back as Eldest. Once a year Clan Bralor assembles on the moon world of D'xun. Where they feast and drink and fight for two days. At the end of the two days, the warriors strip naked and disarm and enter into the jungles. There they run wild through the jungle in teams of two, hunting and killing the beast. Those who return enter their kills to be judged by the Clan Leader, the most dangerous and largest kill from a team that wins is prepared for the final feast. At which point the winners will be rewarded with the hunters mark. A firebrand of a beast claws slashing down their back. These Marked few are among the highest honored amongst the Clan. And given respect by other Bralor where ever they go. Clan Bralor has few Tattoo's that it considers traditional. Its members use whichever Clans they like or that most fit them. But Those of Bralor do find a subtle beauty in scars, especially battle scars. To be a Bralor and to be unblemished is an insult to one's honor. Perhaps which is what leads many of them to start so many brawls. Although there are a few Brands that the Bralor treasure. Such the As The Hunters Mark and the My'tha. Each of which must be earned, the My'tha is perhaps the rarest, for to earn it one must collect the skull of a of a Beast Rider Chieftan. Bralor unlike many of the other clans do use a very strict rank structure. Rank is earned through battle and deeds and no other way. For this is Bralor, the weak and the meek need not apply. The Clan leader is responsible for overseeing all of the Clan. His duties range from the mundane, such as ending blood feuds to the grand such as rallying Clan Bralor to a Cause worthy of their combined Forces. Eldest Brother: The Eldest Brother are clan Elders who have reached the age of 30. They are responsible for maintaining and organizing the local Bralor Mando'ade. As well as caring and teach applicants and helping to raise Bralor Youth in the proper Bralor Way. These few and brave Bralor are far and in between. 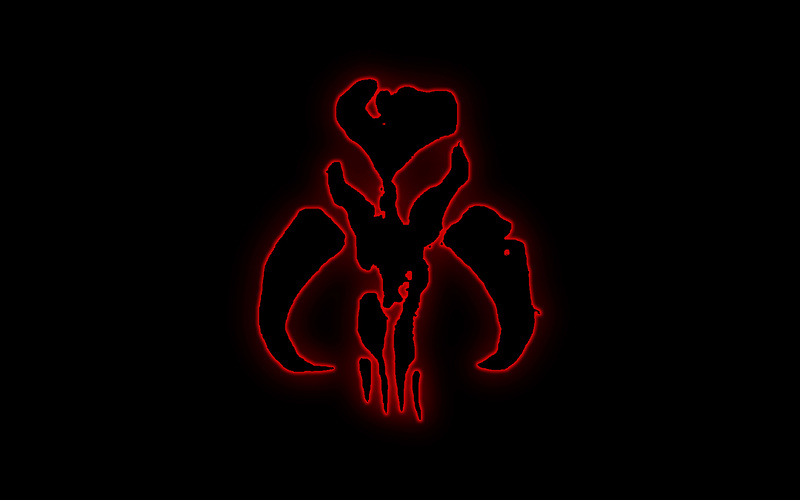 They have gone above what any Mandalorian of Clan Bralor could imagine on the field of battle. Finding Death and spitting in its face, through legendary Deed these men are honored. The walking dead is the term given to honored warrior-injured who can no longer fight or are limited now in their capabilities. These men are honored for they have given much of themselves to preserve the Bralor cause and the Mandalorian way. For even now they March on to find their last battlefield. The winners of the Hunters mark. These men have proven themselves and have earned a great honor. Iron Brothers are the ceremonial heads for Adoptions, Rights of Passages and any other Traditional Ceremony. They are as well one of the most honed and disciplined fighting units in the Bralor Clans ranks. Only a select few Mando'ade live long enough or are brutal enough to join them. Warrior-Brothers are seasoned veterans of many battles and many bounties. They have survived to at least age 22 a feat that is rare for a member of Bralor. The Fresh Faces of the ranks. Those applicants and youth who pass the The Test Of Fire become true adults and Mandalorians.